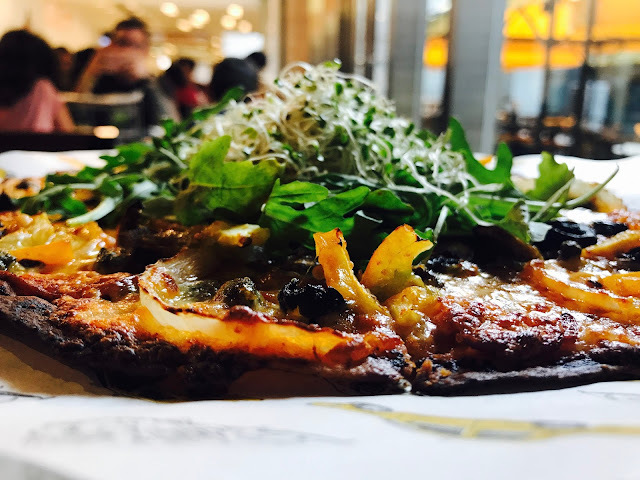 Did you know that a new pizza place has recently opened in CityLink Mall, taking over the corner where Starbucks used to be? 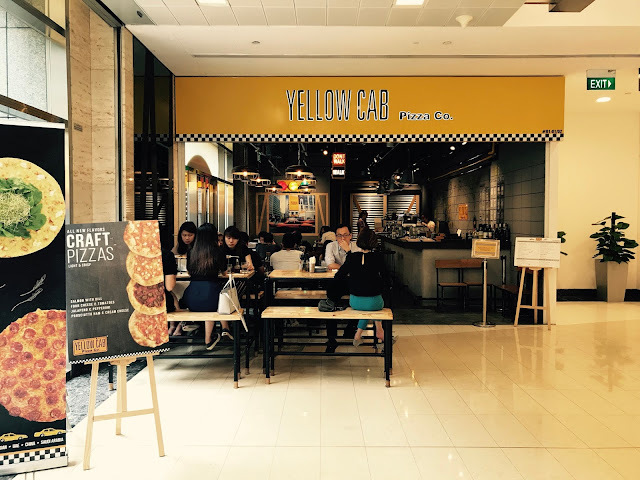 It is the Yellow Cab Pizza Co. that specializes in New York style pizzas. 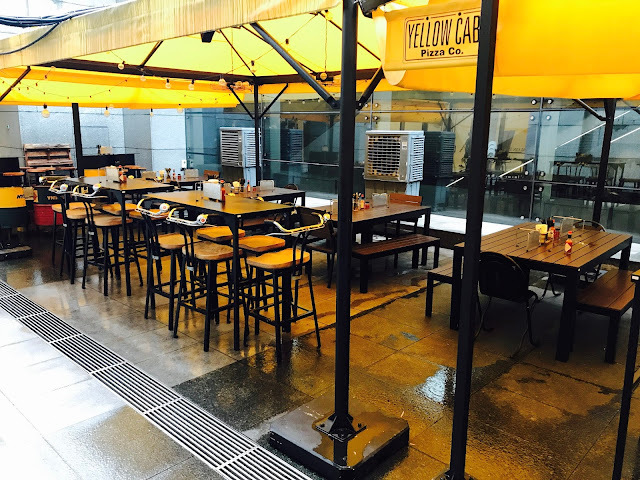 Yellow Cab Pizza Co. offers both indoor (air-conditioned) and outdoor alfresco seating. 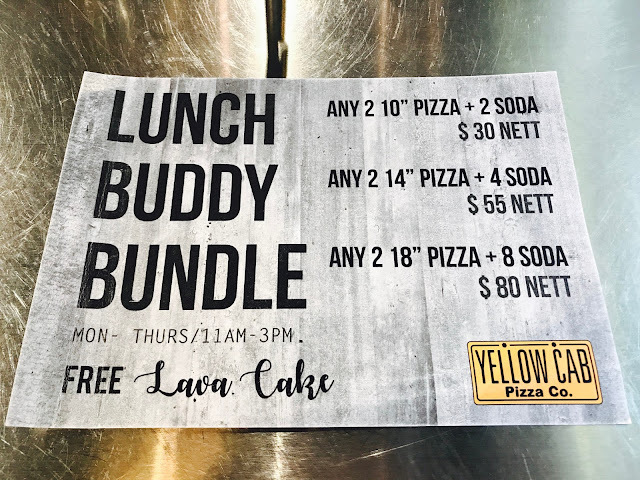 Yellow Cab Pizza Co. offers Lunch Buddy Bundle from Monday – Tuesday during 11 am – 3 pm: any 2 10” Pizza + 2 Soda for $30 nett; any 2 14” Pizza + 4 Soda for $55 nett; any 2 18” Pizza + 8 Soda for $80 nett. This is Yellow Cab Pizza Co.’s signature pizza called New York’s Finest [$17 for 10 inches, $28 for 14 inches, $39 for 18 inches]. 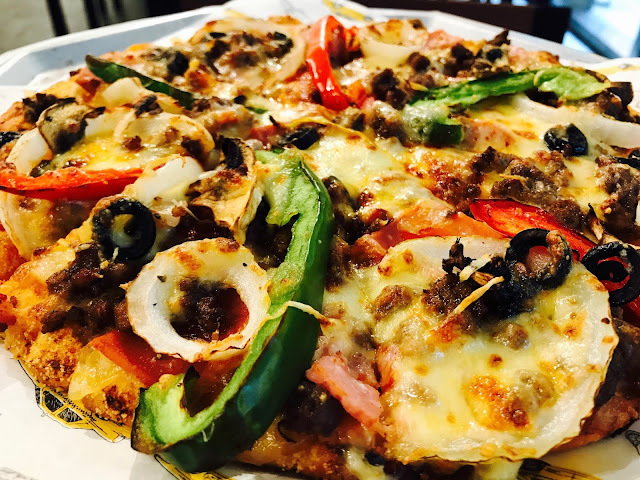 The thin-crust pizza is loaded with pork pepperoni, ground beef, Italian sausage, pork ham and fresh vegetables. They are very generous with the ingredients and every bite you take is bursting with flavour. I love the thin crust of the pizza which is really well baked to achieve that crispiness. Dear Darla Original [$15 for 10 inches, $25 for 14 inches, $36 for 18 inch] is one of the pizzas in the Craft Pizzas section, and I highly recommend it. This pizza is not cut in the regular rectangular shape, instead, it is cut into squares. Pork pepperoni, button mushroom, tomatoes, onions, black olives and capers are spread generously and baked till the thin crust and all the ingredients are slightly charred. Fresh rocket and alfalfa sprouts give this pizza a healthy dose of greens. 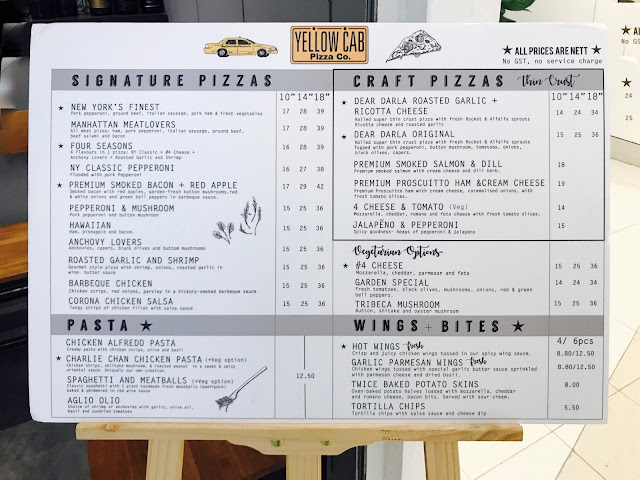 I tried Yellow Cab Pizza Co.’s signature Charlie Chan Chicken Pasta [all kinds of pasta are $12.50] not only because it is one of their signatures, but also because I wanted to try something a little different from the usual Aglio Olio and Chicken Alfredo Pasta. 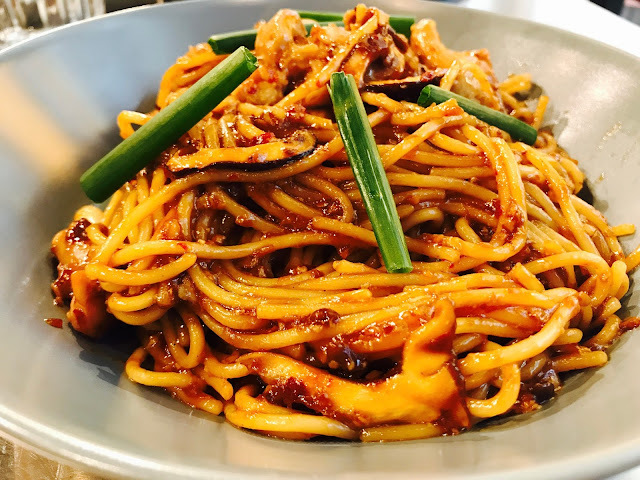 I like the idea of an Italian-Asian fusion pasta, but the sweet and spicy sauce is too gooey and way too sweet. 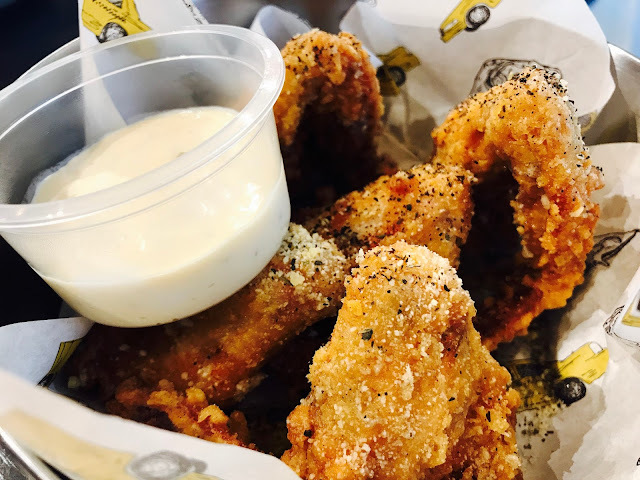 Don’t be frightened off by the word “hot” in Hot Wings [$8.80 for 4 pieces, $12.50 for 6 pieces] because these wings (they are actually drumlets) are not as spicy as they sound. They are sourish with just a tinge of spiciness. 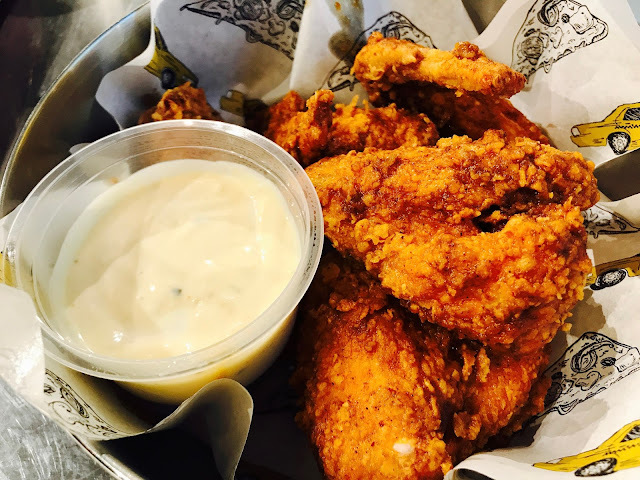 The chicken itself is super tender and juicy, and the outside is crispy. I would get the 6 pieces if I were you because you wouldn’t be able to stop. Garlic Parmesan Wings [$8.80 for 4 pieces, $12.50 for 6 pieces] sounds really good, but I find it not as great as the Hot Wings. The meat itself is still tender and juicy, but I can’t really taste the cheesiness of the Parmesan cheese nor the fragrance of the garlic. I would still go for the Hot Wings if I were you. 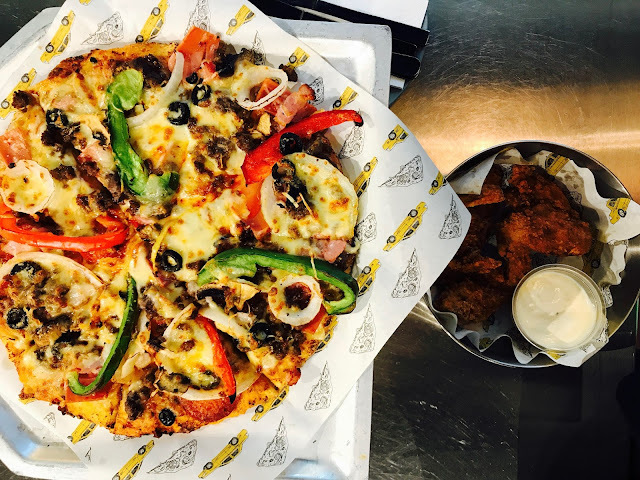 The prices at Yellow Cab Pizza Co. is a little more expensive than the run-of-the-mill pizza chains such as Pizza Hut and Canadian Pizza, but I don’t mind spending a little more on such good quality pizzas like this. 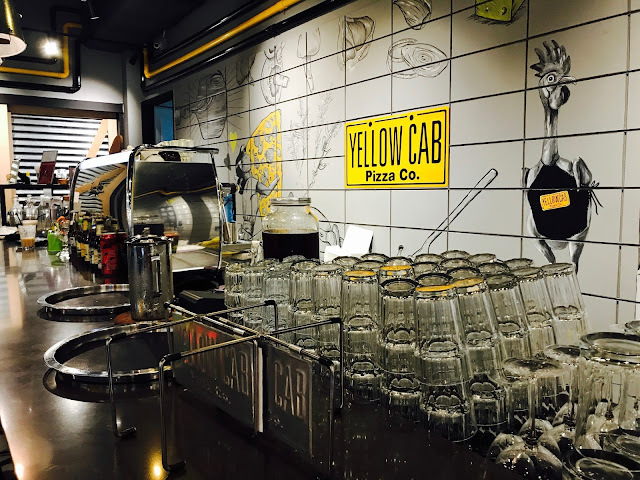 Tags Yellow Cab Pizza Co.